Prestige Business Solutions is a privately owned and operated marketing & sales firm located in Orlando, Florida. Founded in early 2015, we pride ourselves on increasing customer acquisition results for our clients through innovative direct sales and marketing strategies. 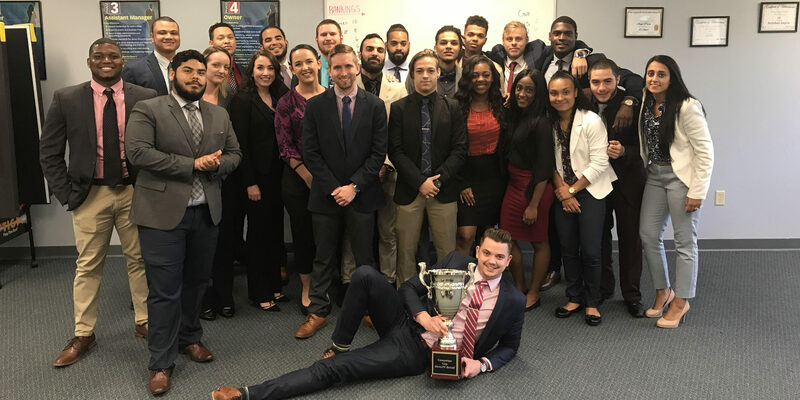 Our team is competitive, driven, and committed to excellence, helping our organization receive recognition as one of the Top Workplaces in Orlando! At the request of our clientele, Prestige Marketing Solutions expands into new locations across the nation! At Prestige Business Solutions, growth is our main focus. We are committed to developing the leaders of tomorrow! On a daily basis, our professionally trained team generates new accounts for our multi-billion dollar clients. We are contracted by large clientele, acting as the liaison between their brands and their target markets. Prestige Business Solutions' mission is to help our clients grow and prosper and to provide the best opportunity for internal advancement to those who are willing to work hard with integrity. By representing the best in their respective fields and working with the finest talent in Orlando, it is our vision to expand our organization three-fold over the next year. Our company’s success stems from our unified, hardworking team. We promote harmony through daily team building exercises, weekly corporate outings, and frequent business trips out of state. Whether we’re playing in a softball tournament, going bowling or out for happy hour, we’re always focused on strengthening the bond of our people for the betterment of our organization. We are proud to support charities, such as Operation Smile, as a way to give back to those in need. By partnering with an international philanthropy like themselves, we raise awareness and funds for children born with cleft lip and palette in third world countries. We believe in the power of clear communication, and that our talents should be used to help our local and global community. At Prestige Business Solutions, we value entrepreneurial spirits. In fact, we’ve molded part of our business model to include finding, hiring, and training budding entrepreneurs into successful managers capable of overseeing their own marketing & sales firm. Entrepreneurs are risk takers, willing to do whatever to get the job done in order to have a successful life, and there’s nothing we love more than working with winners. Having integrity in business is easy when you have the right leadership. At Prestige Business Solutions, we’re fortunate to be managed by some of the most wholesome and authentic leaders who remind us that the legacy we are building starts with what we do when no one is looking. In honor of our clientele, we place huge emphasis on working with the highest character worthy of their brand. Here at Prestige Business Solutions, Inc we pride ourselves on providing clients with a personal, and professional approach. We are currently offering a sales and marketing position that includes comprehensive training. We will train this individual to learn a variety of skills from sales and human resources to management and leadership. As a fast-paced company in the direct sales and marketing industry, a successful candidate will have the opportunity to advance within the organization. We only promote within!